Traditional whipped cream is loaded with heavy cream and refined sugar, this coconut whipped cream is the perfect healthy alternative! There are so many reasons to choose for this healthy type of whipped cream compared to regular whipped cream. 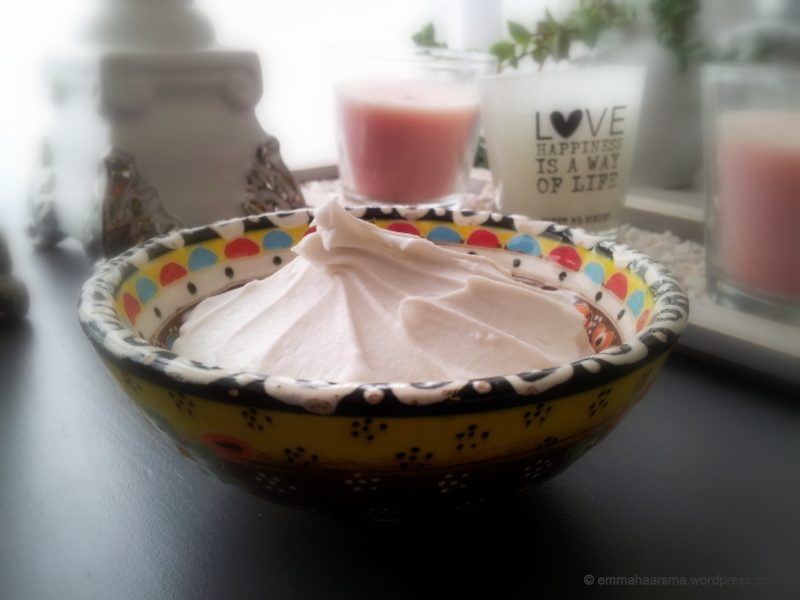 – An additional plus is that whipped coconut cream does not break down the way dairy does. This whipped cream can be covered and stored for up to a few days without separation taking place. – Suitable for Vegans and people with a dairy an allergy. – Put the can coconut milk in the fridge for 1 night, this will cause the cream will separate from the milk. 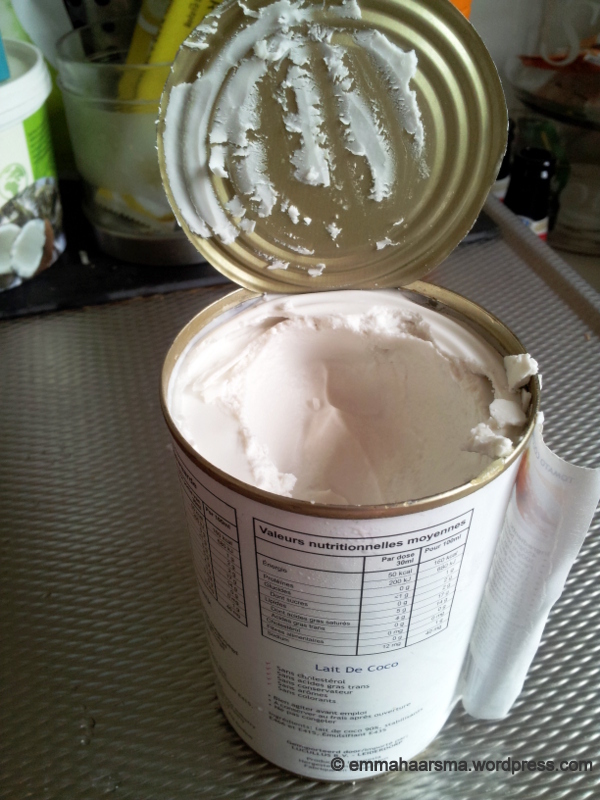 – Open the can, as you can see the top is full of cream and the coconut water is in the bottom of the can. Don’t throw the liquid away because you can use this for making delicious smoothies! 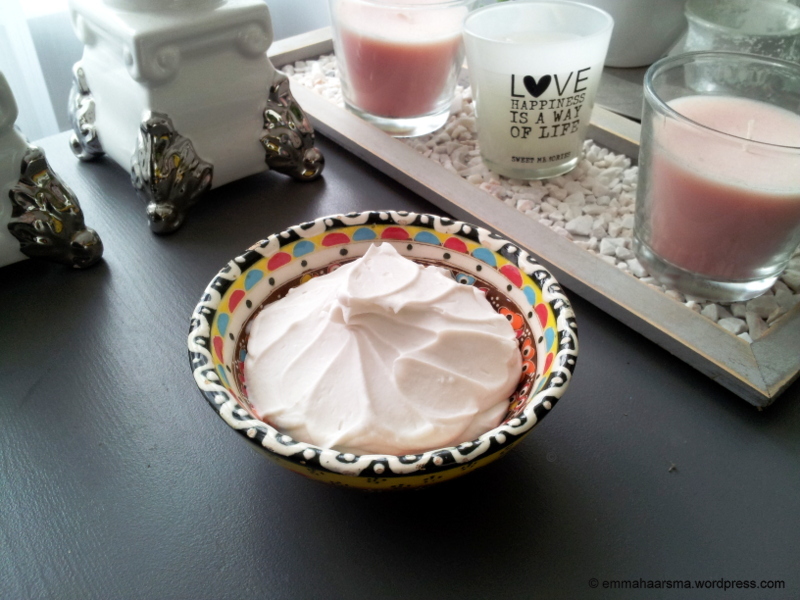 – Put the cream and the agave syrup together in a bowl and mix this with a small hand mixer until it gets fluffy. That’s how easy it is! Ready in a few minutes! 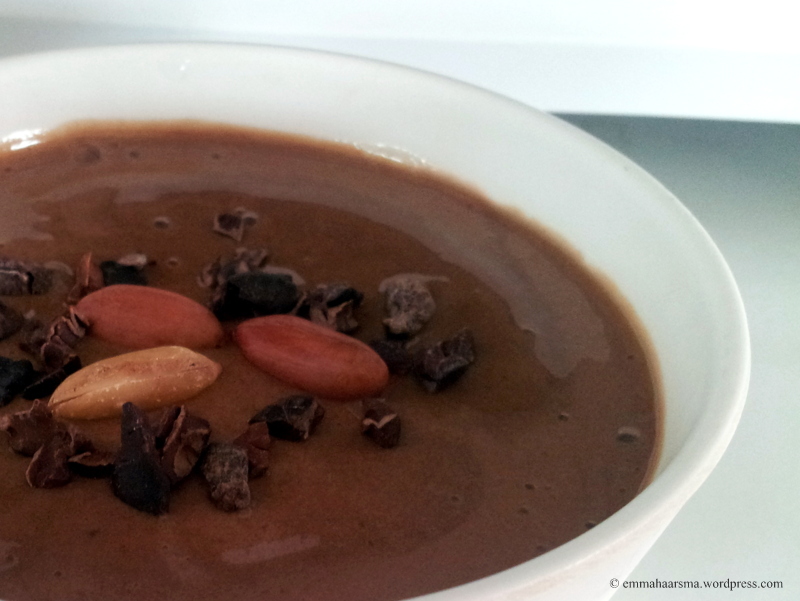 – Mix all the ingredients together except from the dried fruit in a large bowl and mix this. – Put a baking paper on a baking plate and spread the mixture on the baking plate. – Bake this in the oven for 10 minutes, then stir and continue baking for 10 more minutes. 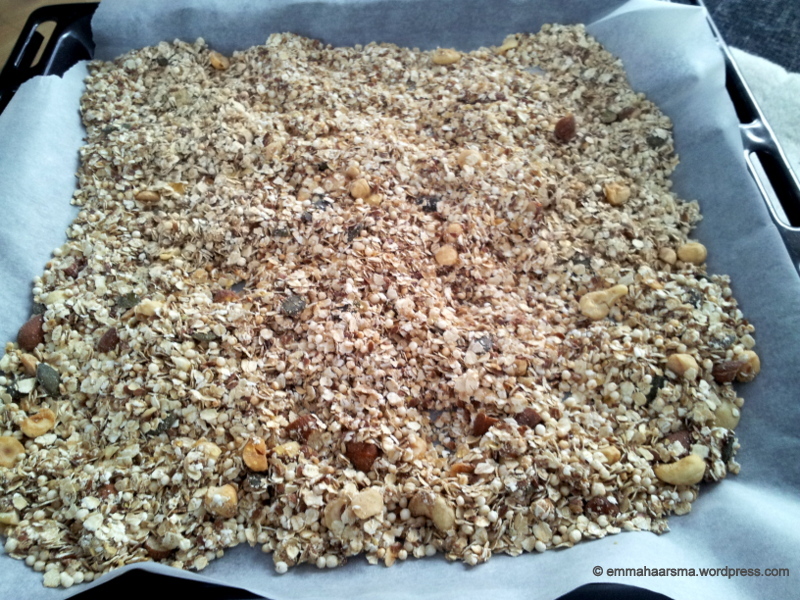 – Place the baking plate on a wire rack and cool the granola to room temperature. 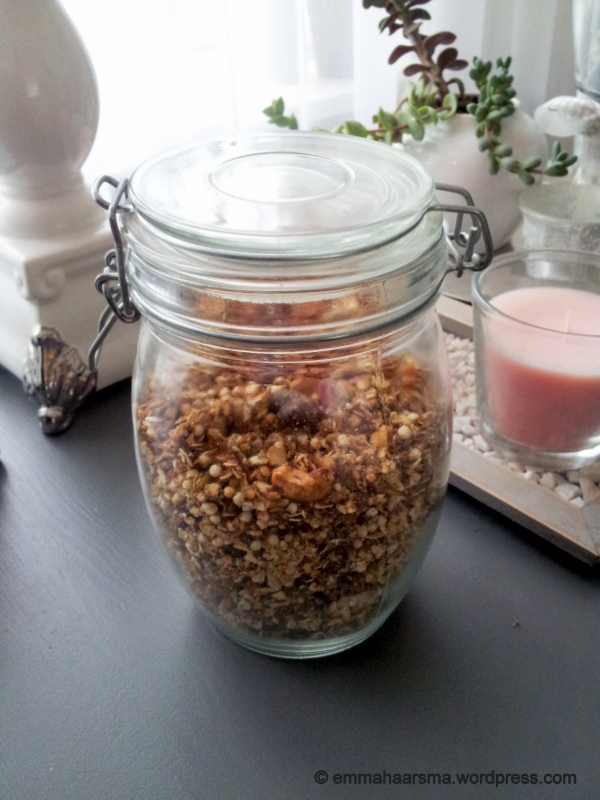 – Add the dried fruit and put the granola airtight jar. You can keep the granola for about 2 weeks. For the topping you can use whatever you like! This time is used cocao nibs and peanuts. You can also use other nuts, fresh fruit or dried fruits. – Remove the skin from the banana’s and cut them in small pieces. – Put them in the freezer until they frozen. – Put all the ingredients in a blender, and blend it until it’s smooth. 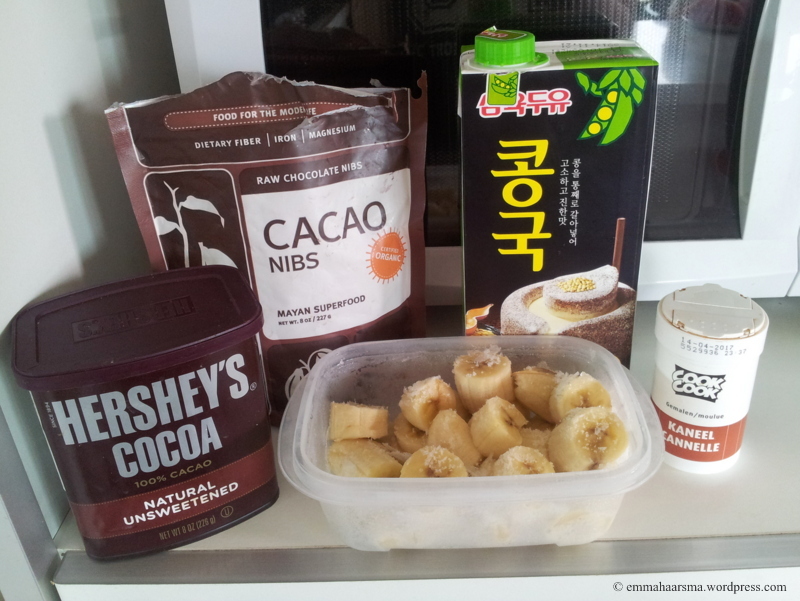 – Put the banana ice cream in a bowl and top or mix it with you favorite products. Turn a zucchini into spaghetti, It’s possible! This great meal for one is a good way to eat more veggies and super quick. The easy way is to use a spiral slicer, so you can make small long spaghetti slices. Otherwise you need to cut them with a knife in small long strips. Apart from being made into a delicious and savory dish, zucchini is beneficial for your health in a variety of ways, thanks to the vitamins and minerals contained in even an small serving of this vegetable. Zucchini is rich in vitamins A and C as well as antioxidants which can benefit your skin in many ways. Zucchini hydrates your skin, got anti- ageing benefits and can treat puffy eyes! – Scrub and clean fresh zucchini and remove the ends. – Use an spiral slicer for making long spaghetti slices. – Cut the cucumber in small slices and also the tomatoes in two pieces. – Boil water and add the zucchini, boil this for 2 minutes. 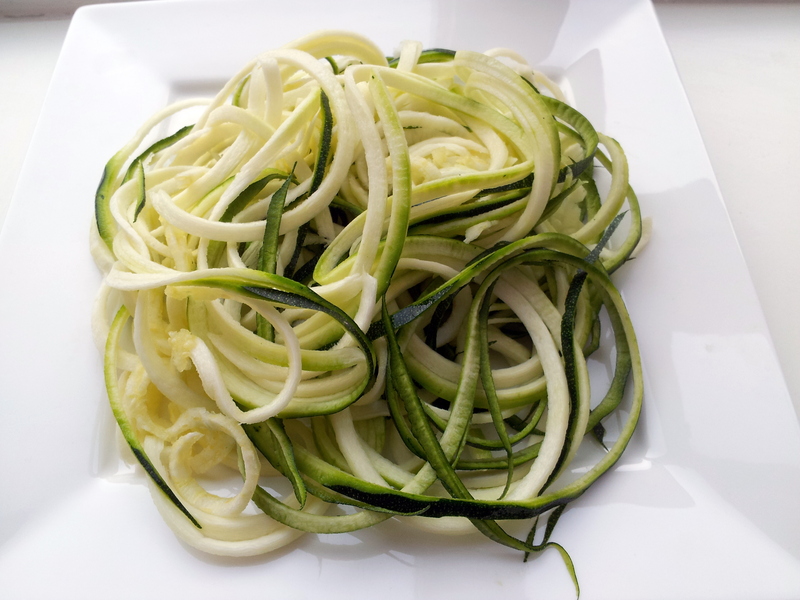 – You can boil it longer but or maybe less than 2 minutes, it depends on how soft you want your zucchini pasta. – Mix now the zucchini pasta with the pesto and put this on a plate. 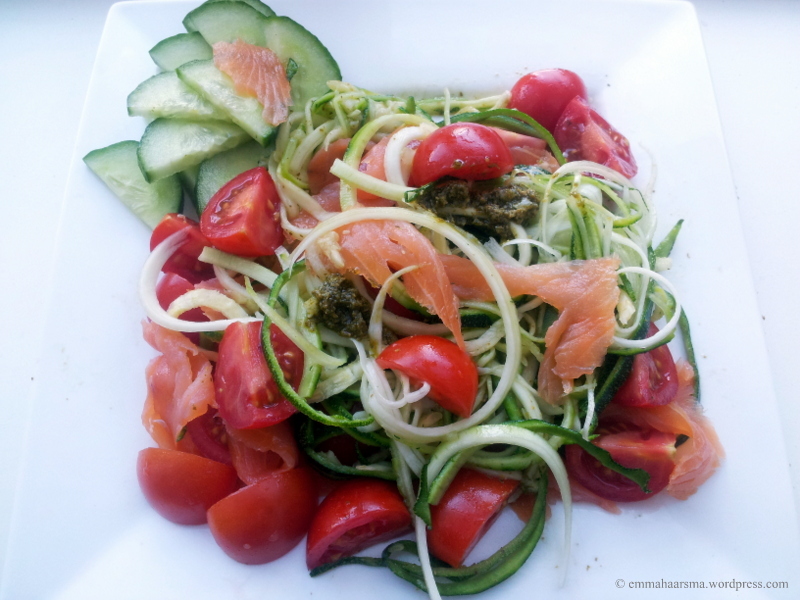 – Add the cucumber, tomatoes and smoked salmon. 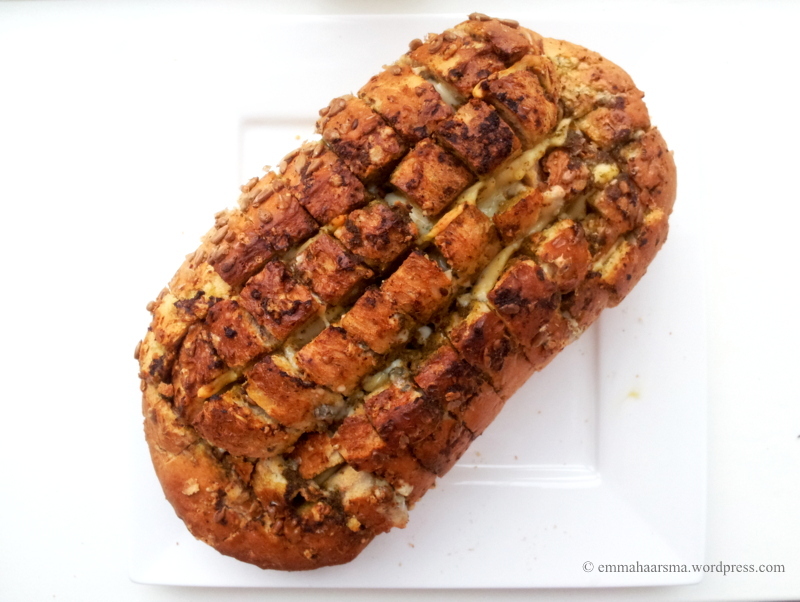 Bloomin pesto bread makes a great birthday snack or appetizer for any party or get-together. 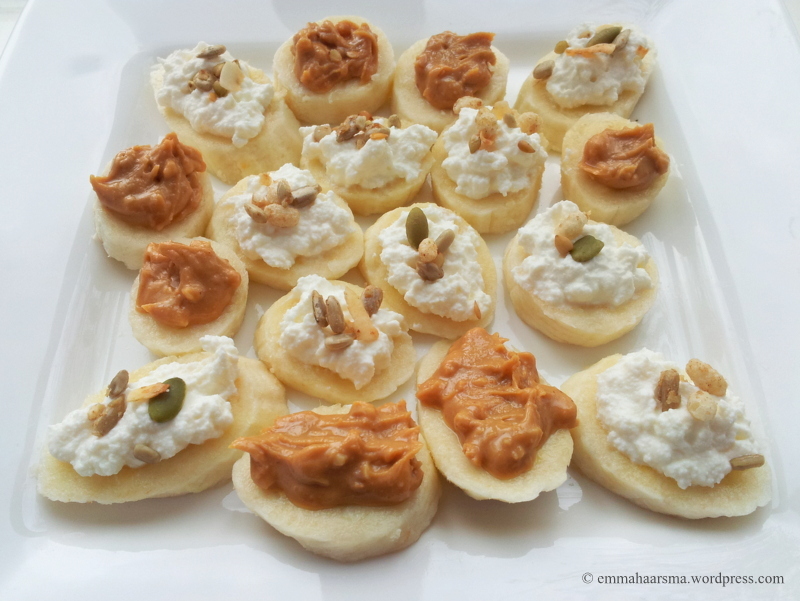 Easy to make & easy to eat. 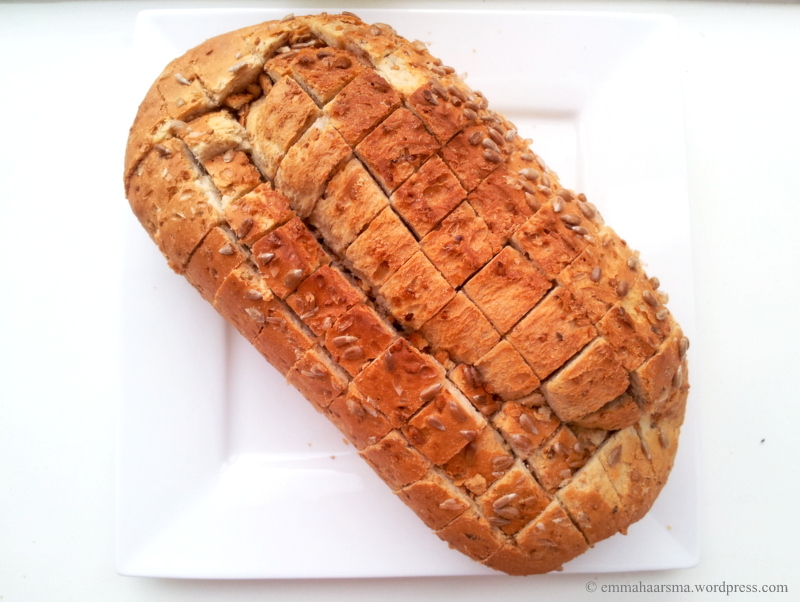 I made this recipe before and i saw so many recipes of blooming bread on the internet. But i decided to make a more healthier version. Sugarfree and Clean! You can use so many different kinds of bread you like, but for a healthy choice choose for spelt or whole-wheat bread. I used a natural pesto that contains only basil, garlic, Italian cheeses, pine nuts and olive oil. And two different kind of cheese i like, but you can use every kind of cheese you like! – Cut the bread lengt hwise and width wise without cutting through the bottom crust. – Cut the blue cheese in small pieces. – Put some of the pesto into the cuts. – Insert also the cheese slices and blue cheese between cuts. – Grease on the top of the bread the other part of the pesto. – Put the bread in the oven for 25 minutes. I put it on the table with guacamole as a dip! The great thing about Bloomin bread is all the different possibilities and ways you could make this style of bread. So everybody can make this bread and add products you like! I’m a big fan of spelt so I use it a lot in my recipes. I use spelt flour, oats, cookies, pasta and also spelled bread. I’m a big fan, because of the amazing healthy benefits and the good taste and quality! A lot of people don’t eat bread anymore because they are on a diet, but if you choose for the right bread you can eat bread in a healthy lifestyle. I agree a lot of bread lately is not that healthy anymore, it contains bread improvers like sugar, brightener and preservatives to make look the bread better, tatste better or smell better. So this is not for the quality of the bread but to makes it sells better. Many people choose for a dark- colered bread because they think it’s healthier, But!! 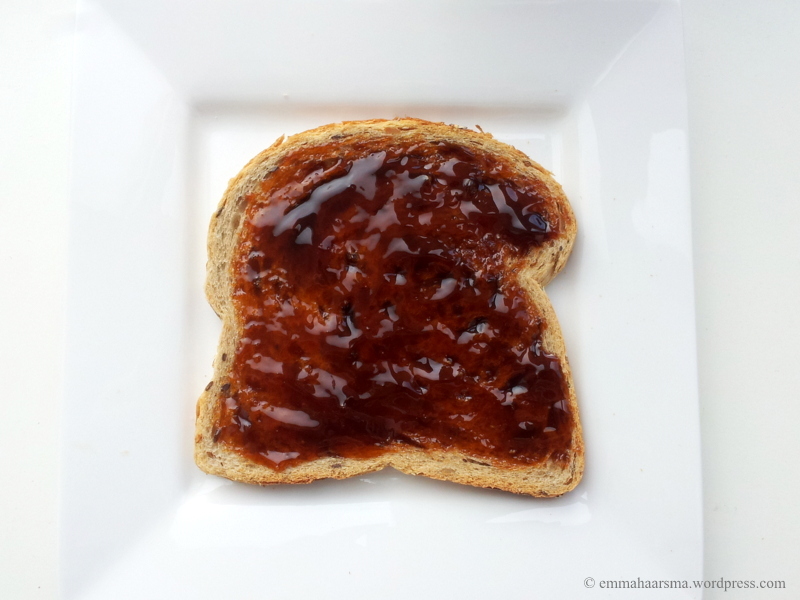 a dark-colored bread is not necessarily healthier! Most of the time dark- colered bread is fake. You can make the bread never so dark naturally wise. They add funds to it to make it look dark so it also sells better. The percentage that is truly whole grain is much, much smaller. The darkest natural bread is only slightly tinted, darker colered bread is not made on a natural way. For these reasons I prefer to eat spelt bread, but why is spelt bread better? • Spelt is High in protein, Fibre, vitamins and complex carbohydrates. • Spelt contains complete Protein: contains all the essential amino acids needed by the human body. • Spelt has 3.25 mg iron, an essential mineral needes for healthy red blood cells. • It is higher in water solubility, making it easier to digest and aiding in the nutrients being more easily absorbed by the body. • Spelt ensures a uniform blood sugar levels, what spelled grain makes particularly suitable for people with diabetes. • This benefits makes you eat less, so it’s also good for weight lose or weight control. • Spelt can reduce the risk of childhood asthma considerably. So……. there are so many good things about spelt, so why not eating spelt bread!? 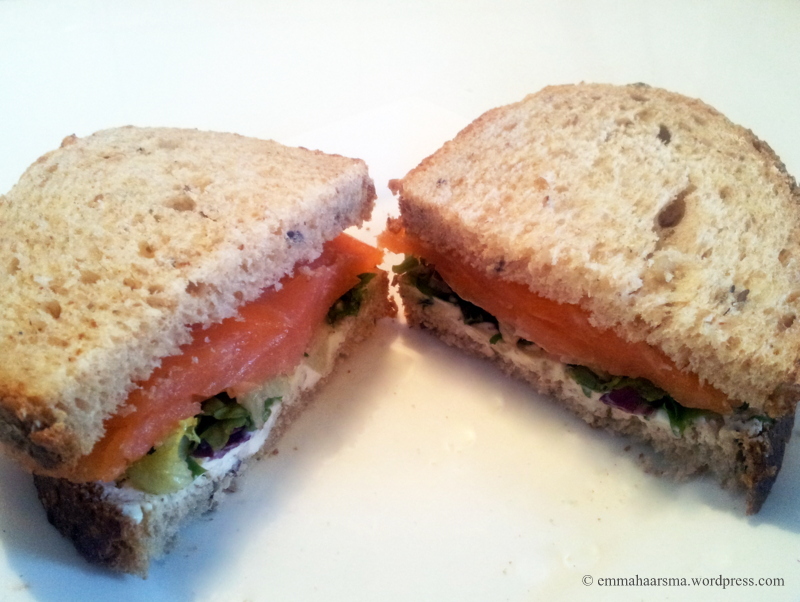 Choose a good quality bread and a healthy spread or topping, an you can creat a healthy sandwich all clean! 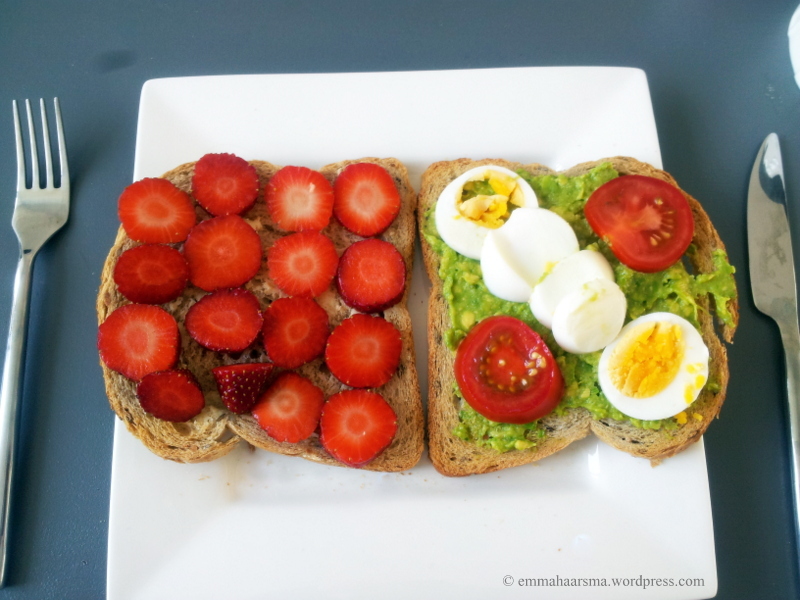 Because I get a lot of questions about what kind of bread I eat and what I eat on my bread, here a few healthy sandwich recipes, all clean and sugarfree! – Grease the soya butter on the two slices of bread. – Wash the strawberries and cut them into small slices. 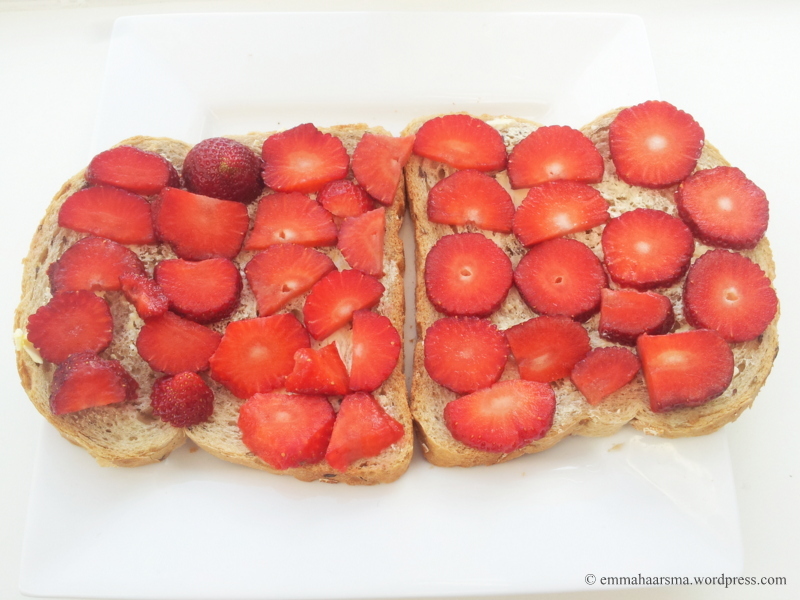 – Top the strawberries on the bread with soya butter. – Grease the cream cheese on the two slices of spelt bread. 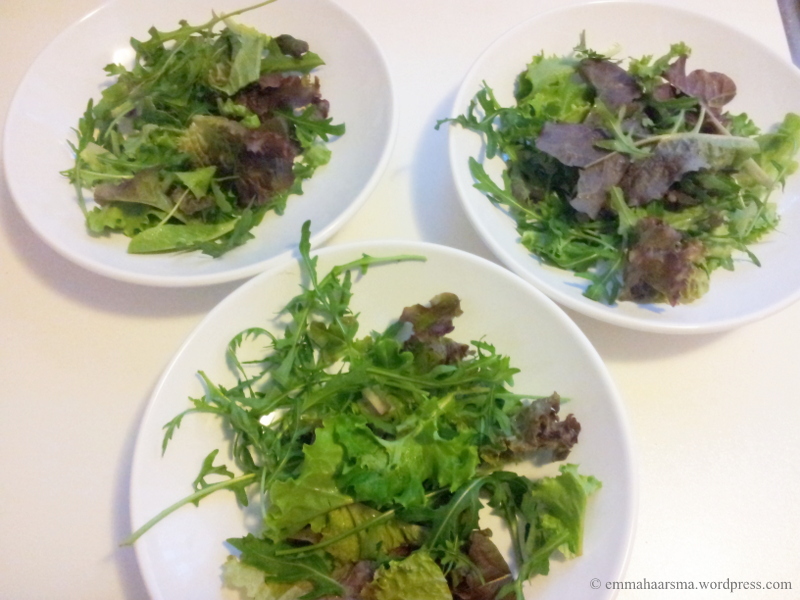 – Top it with the lettuce and salmon. – Put the peanut butter on the spelt bread. – Cut the banana in small slices. 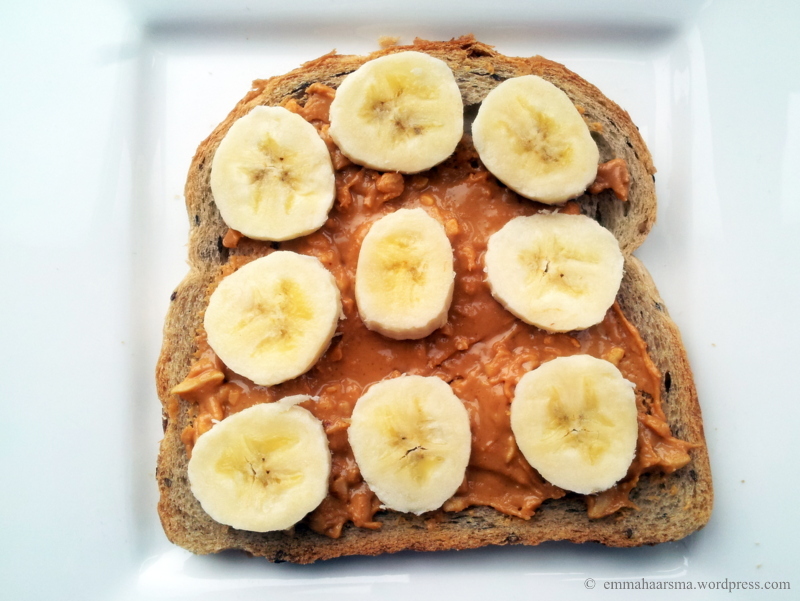 – Top the spelt bread with the peanut butter with the banana slices. – Grease the slice of spelt bread with the apple syrup. – Mash the avocado on a plate with the lemon juice, garlic and chilli. – Put this on the roasted spelt bread. 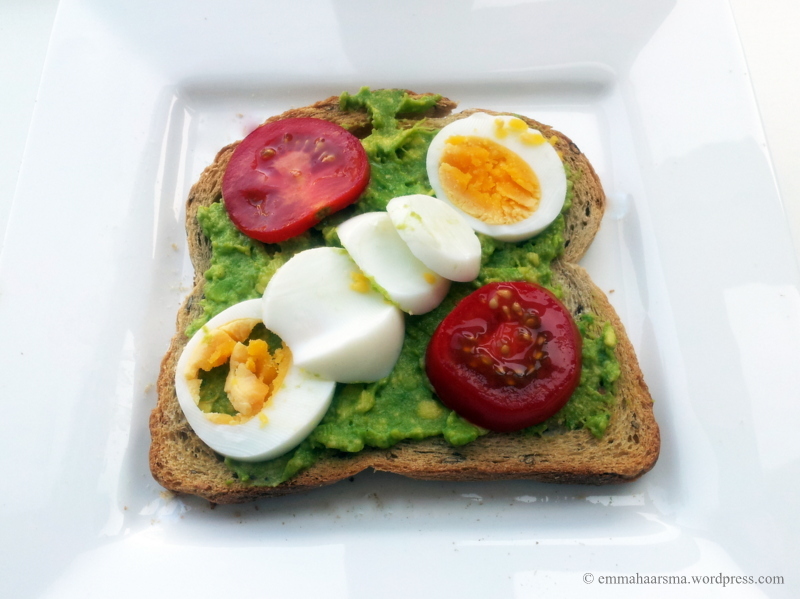 – cut the egg into slices and put this on the bread together with the tomato slices. 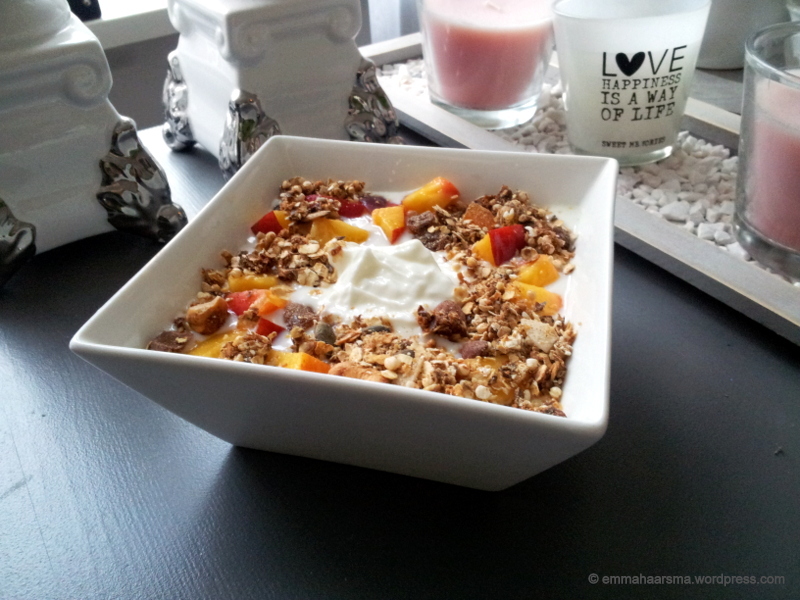 Oatmeal for breakfast, a perfect way to start a day of healthy eating! And it gets even better, because you can start the day also to take a part of your daily veggies. I know! you’re thinking vegetables in my oatmeal?? Yes, it’s possible 😉 Zucchini become widely used in baking recipes to give it a moist texture. 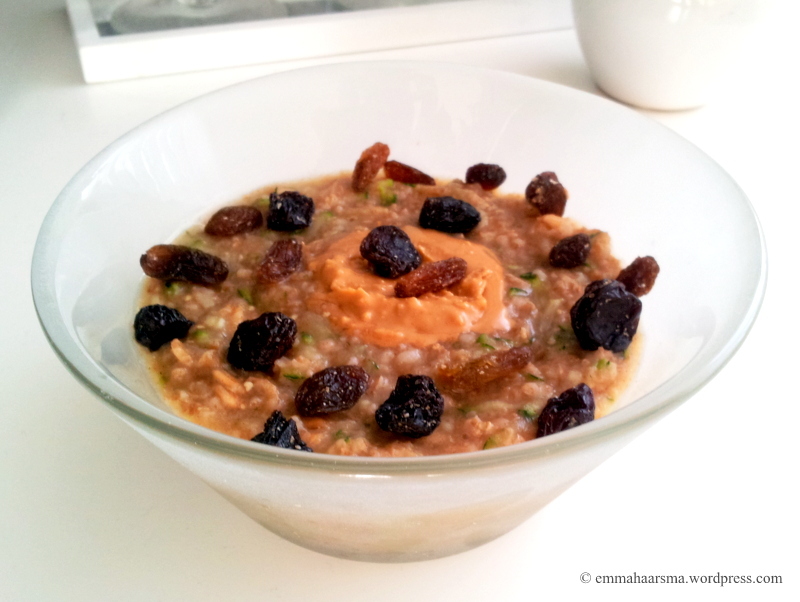 Don’t be afraid of the taste because you will get a delicious creamy oatmeal! The most of the time when i’m making oatmeal, i use spelt oats because of the many good qualities of spelt. But you can also use other oats you prefer. – Put the almond milk and water together in a pan and heat. – When the water and milk boils, turn the heat to low, add the spelt oats and cook, stirring, until the water and milk is absorbed almost, about 5 minutes. 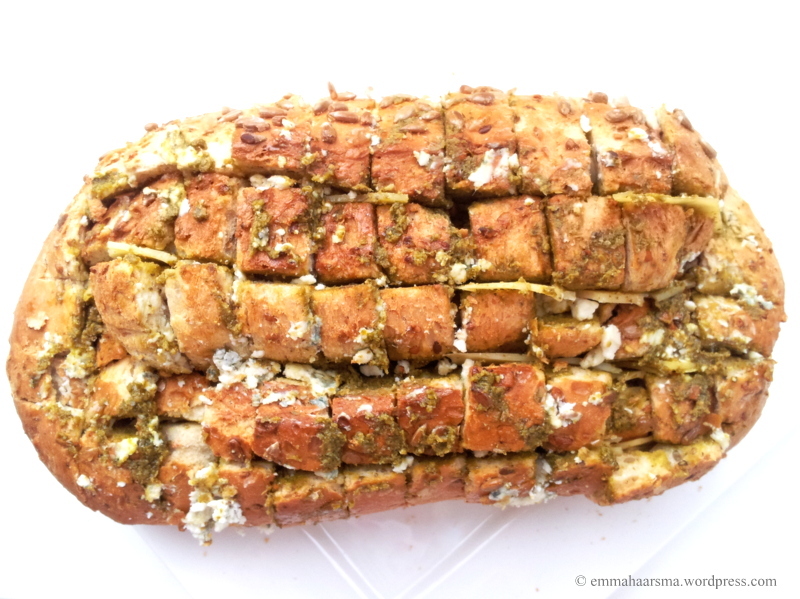 – Add the grated zucchini and cinnamon. – Heat this untill the water and milk absorbed for 95%. 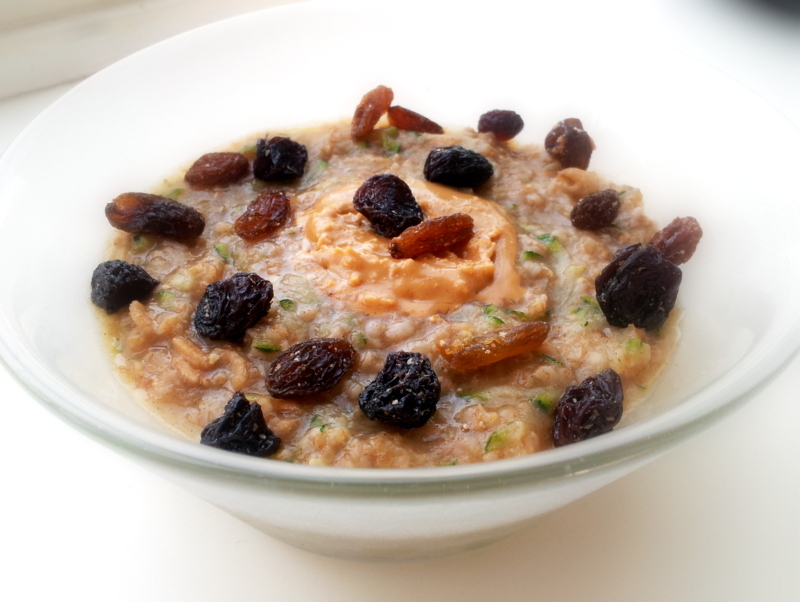 – Put the oatmeal in a bowl and top it with the raisins and peanut butter. 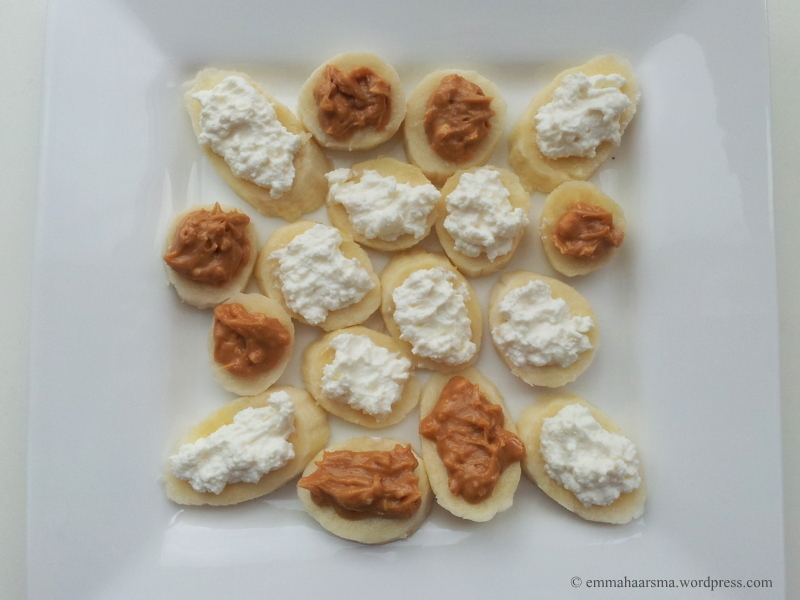 This snack is healthy, delicious, easy and gives you enough energy for a long time! 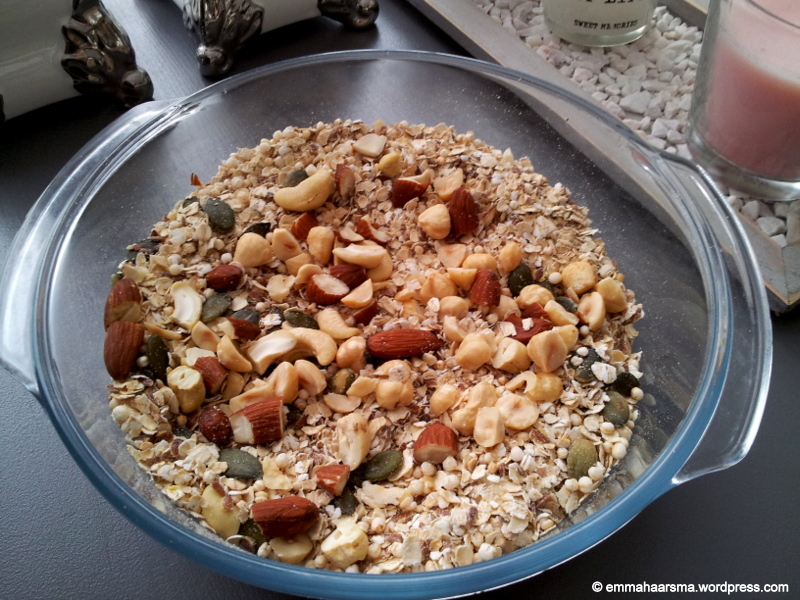 I used organic muesli and peanutbutter because they are natural and only contains natural sugars. 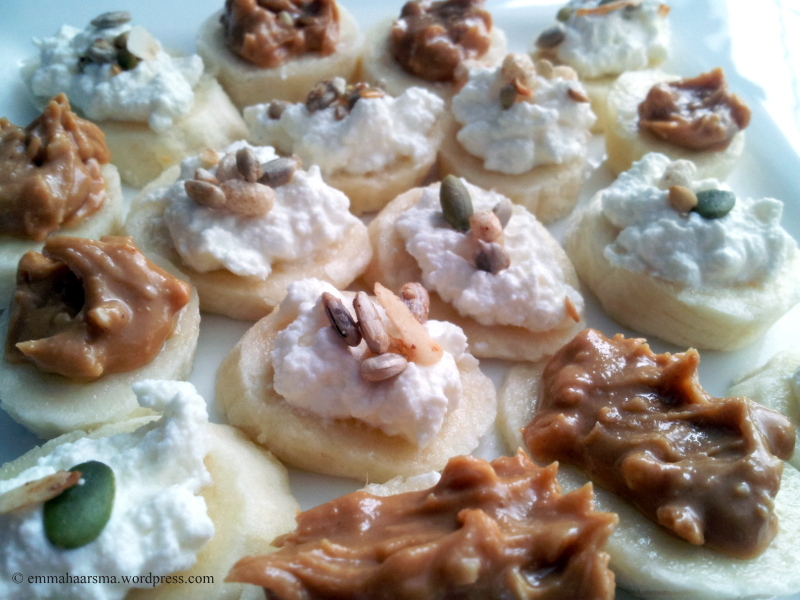 – Top the banana slices with the peanutbutter and ricotta. 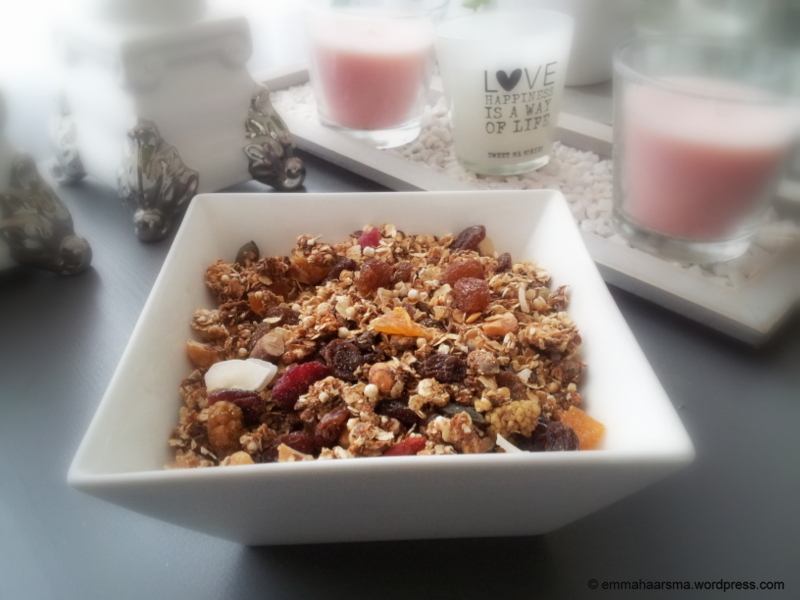 – Top this with the muesli. I was craving for something delicious but I couldn’t decide what. Should I make a cake with chocolate or chocolate chip cookies with peanut butter drops? 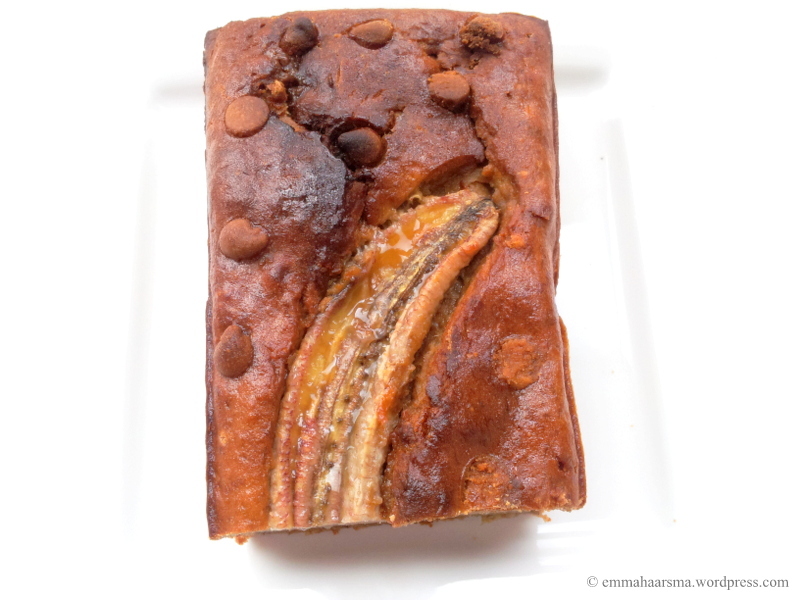 So I was thinking how I could make a delicious new recipe whit that combination… Because I had a lot of ripe bananas I decided to make a banana bread. And what could be better than the combination of chocolate, peanut butter and banana all mixed up in one delicious cake? 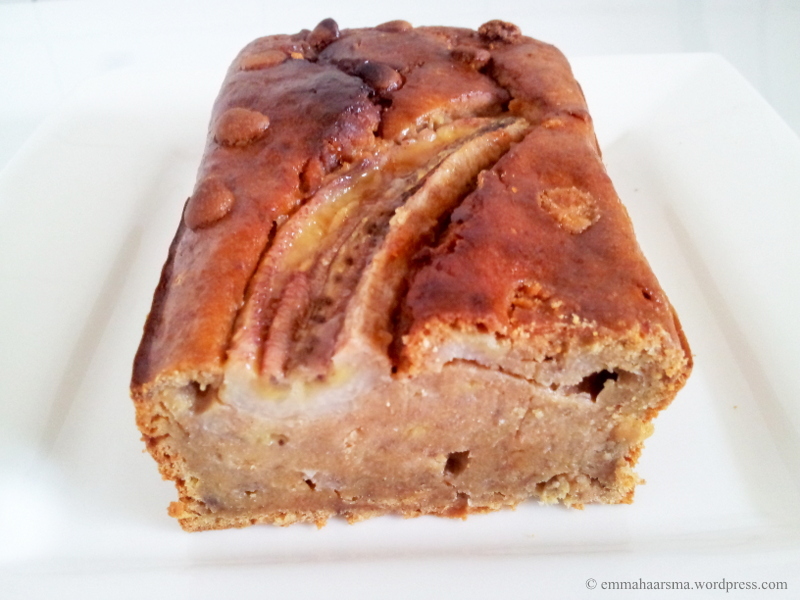 The entire banana bread is almost sugar free and clean! The base of the banana bread is clean and sugar free, the only thing I added with sugar is the Reese’s peanut butter drops. But if you prefer to eat totally sugar free you can keep them out of the recipe. 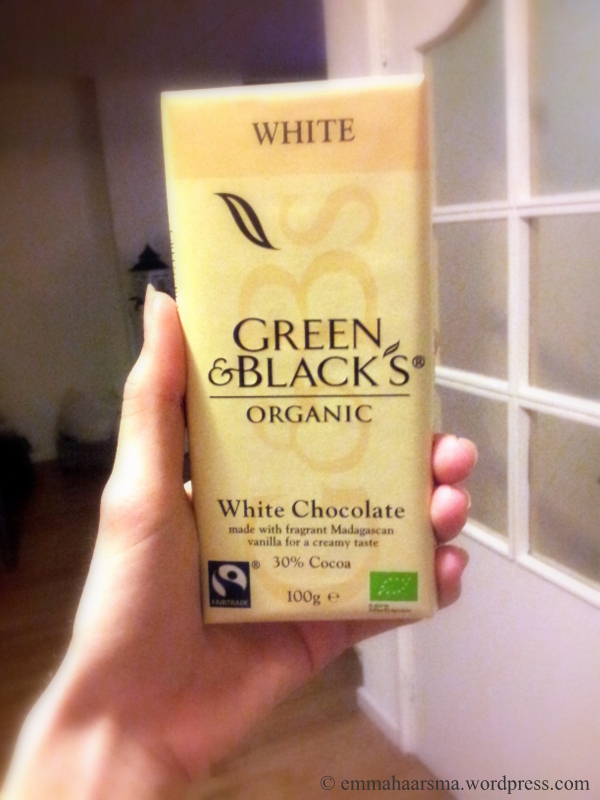 The chocolate I used is Green & Black’s organic white vanilla chocolate. But you can use every chocolate you like. 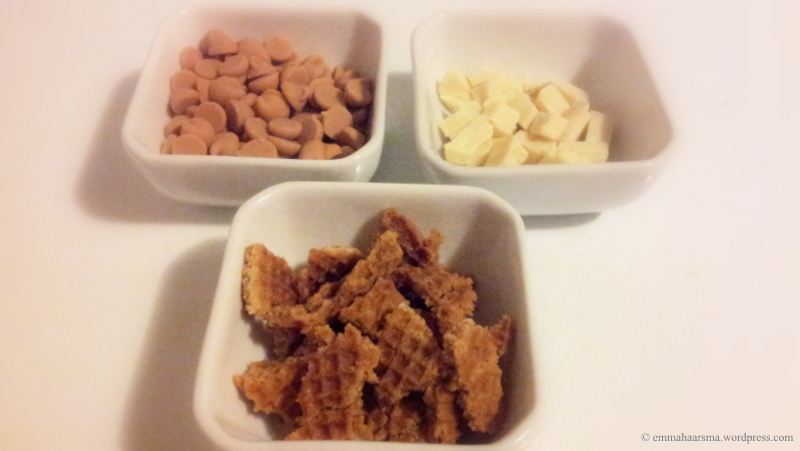 The cookie I used was a typical Dutch cookie named: Stroopwafel, It was a organic spelt caramel cookie what you can buy in the organic food stores, but of course you can also add other cookies you like to the dough. But I prefer to use organic food! They are all natural and without processed sugars. 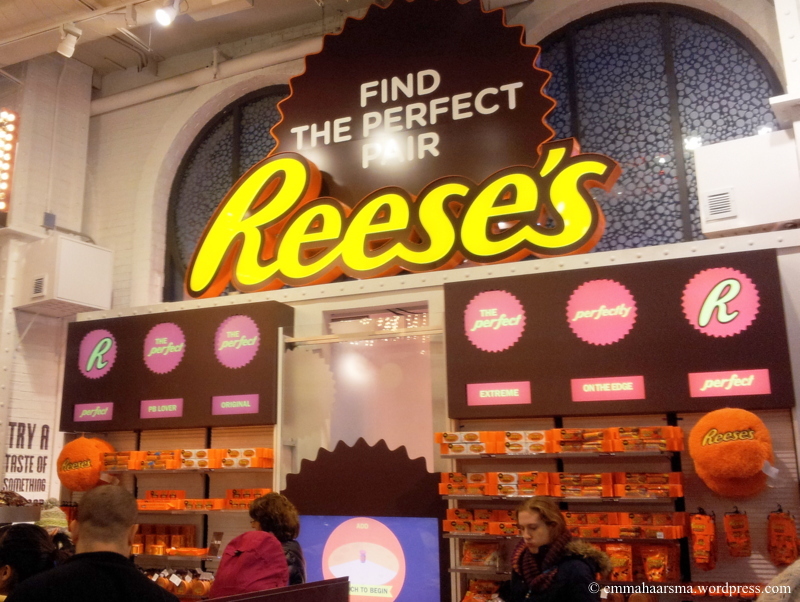 Reese’s store in New York!! – Rinse the chickpeas and cook them in the almond milk for a few minutes until they are a little bit soft. – Grease the oven baking pan with a little bit of soya butter. 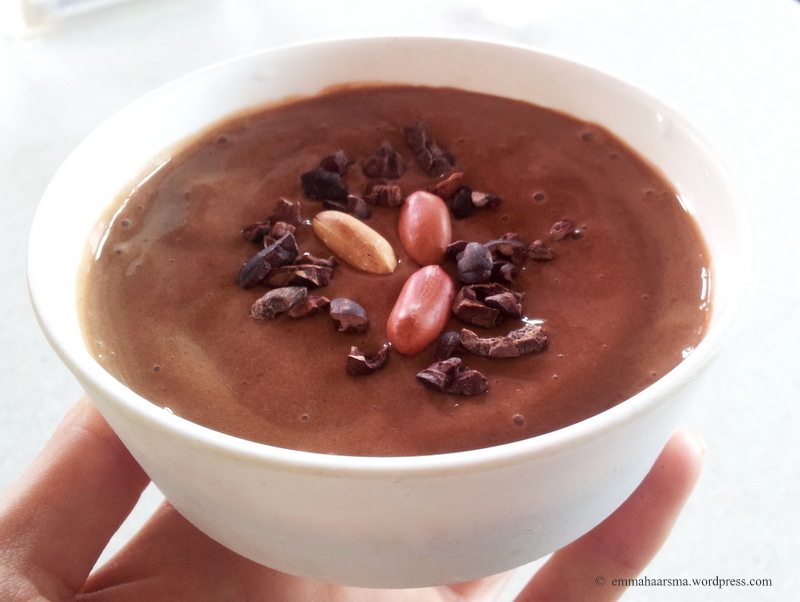 – Put the chickpeas and the almond milk in a blender and blend until it’s a smooth dough. – Put the dry ingredients together and mix them with a spoon. – Cut one big banana horizontal in two pieces. – Put together in a bowl the bananas ( except from one half slice that you just cut), the eggs, soya butter and the chickpeas with the almond milk. – Mix this in the bowl with your hand and add the dry ingredients and mix it again with your hands, just until the flour disappears. – Add also the chopped cookie, chocolate and the Reese’s to the dough. 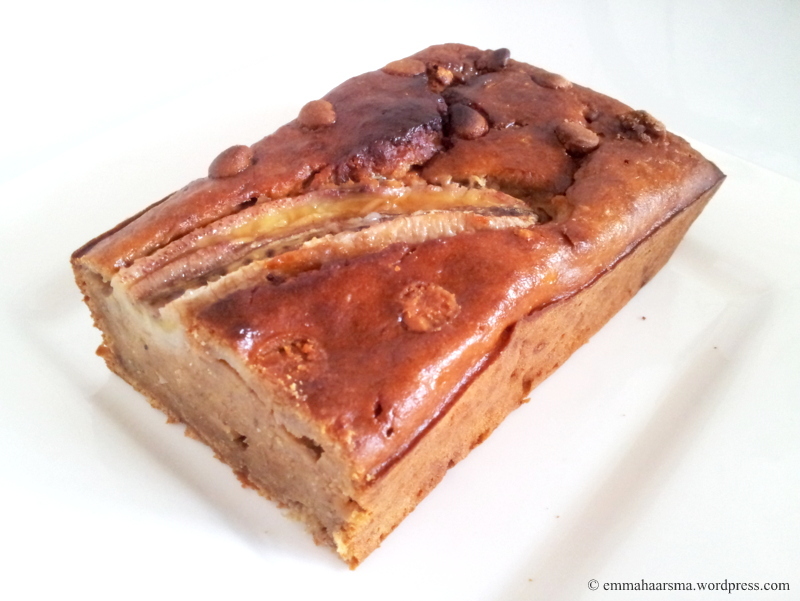 – Put the dough in the oven pan and put on the top of de dough the banana slice. Push him a little bit into the dough. – Transfer to the oven and bake for about an hour, or until well-risen and golden-brown. – Remove from the oven and cool in the tin for a few minutes, then turn out onto a wire rack to cool completely before serving. 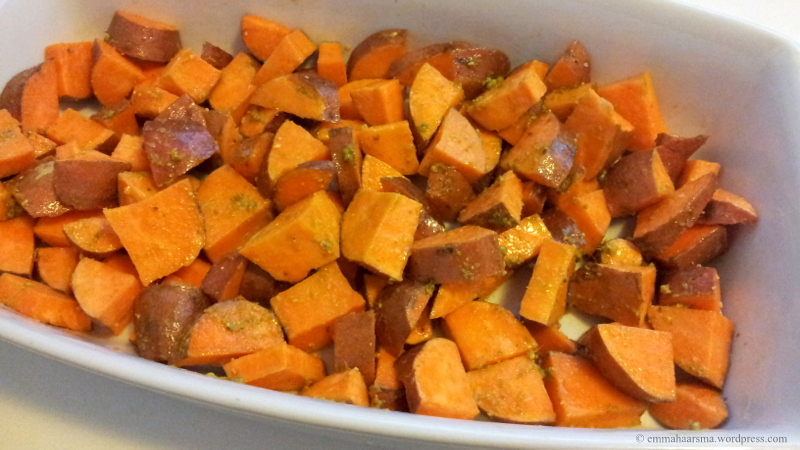 – Wash the sweet potatoes and cut them into small pieces and put them in a baking dish. – Heat one tablespoon coconut oil in the microwave until it’s liquid and sprinkle this on the potatoes. 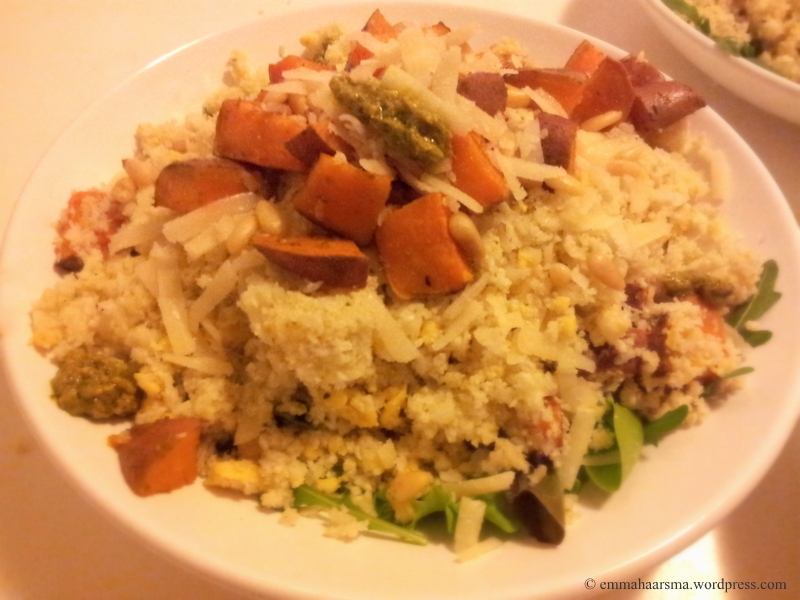 – Mix the sweet potatoes with the salt, a tablespoon pesto and half of the chopped garlic. – Put this in the oven for 30 minutes. – Mix the beaten eggs with the soya milk. – Put a tablespoon oil in a pan, heat it and add the beaten eggs. – Stir the eggs slowly with a wooden spoon. – Your eggs are done when they still look silky and slightly runny and underdone. – Put them away so you can add them later to the cauliflower rice. 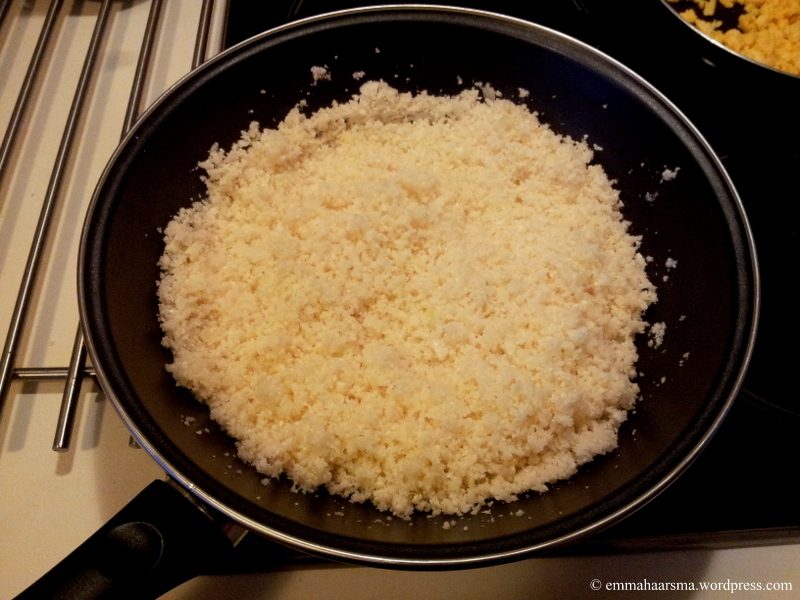 – Put in a wok 2 tablespoons coconut oil and add the onions and garlic. 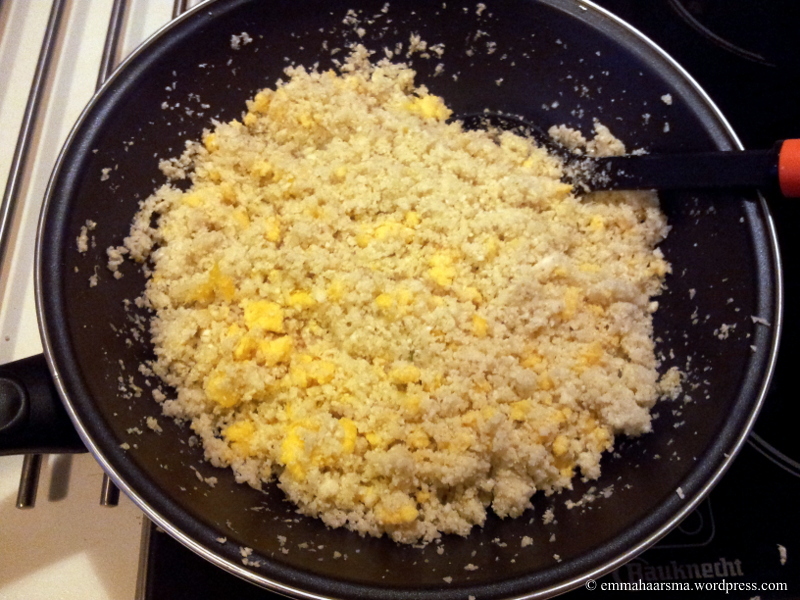 – Add the cauliflower rice and cook this for 8 minutes. – Add after 8 minutes when the cauliflower rice is slightly crispy the pesto, half of the parmesan cheese and the scrambled eggs. 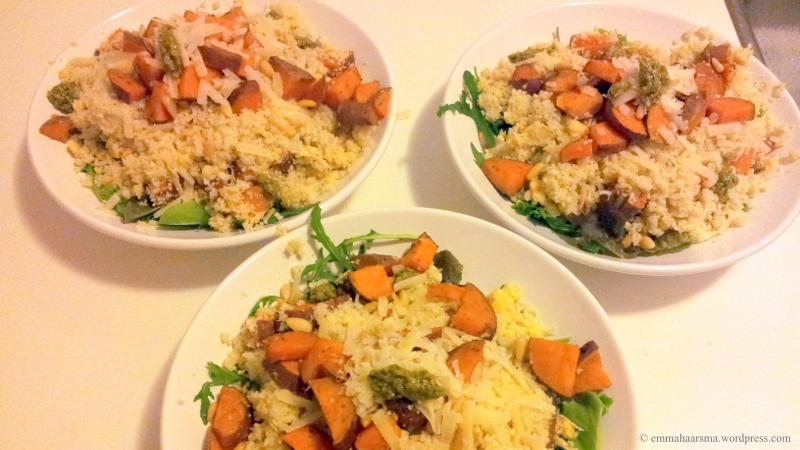 – Divide the rocket on three of four plates and top this with the cauliflower rice and mix this with a few sweet potatoes. 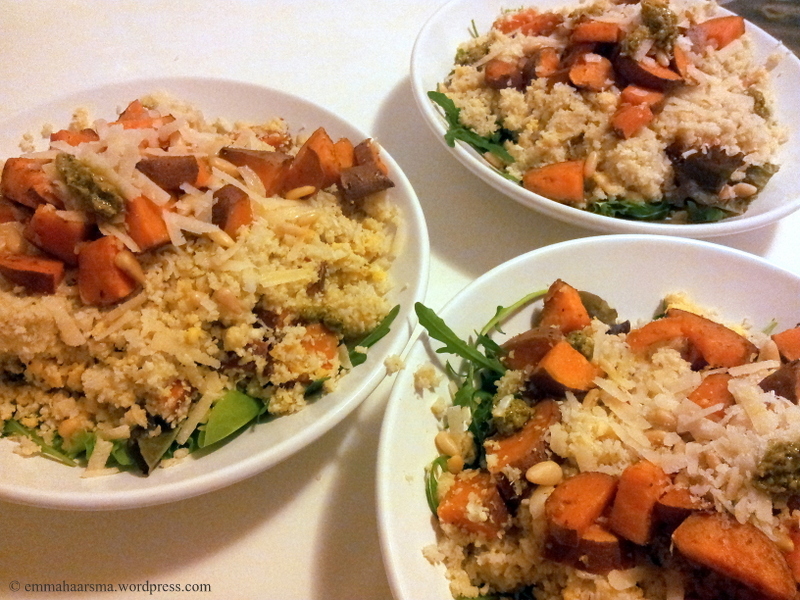 – Top it with the other sweet potatoes, parmesan cheese and pine nuts.